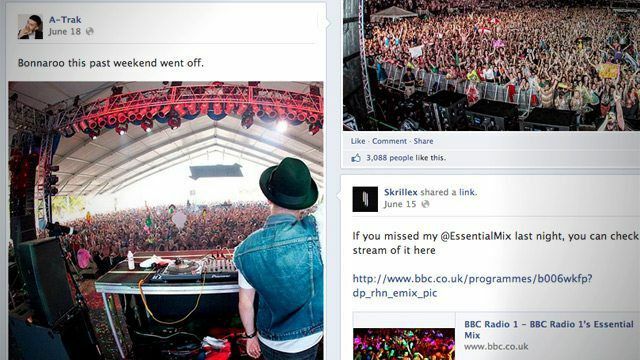 In our final article in our series on DJ social media success, we’re covering one of the most important activities you should spend time on. As a DJ, it is critical that you upload media content, like photos, videos, and music, to your social media channels regularly to keep fans engaged. This is the opportunity to captivate, impress, and interact with the people who already have said that they’re fans, so make sure you do it right! A great new DJ mix, a hilarious photo, or a killer new edit, can really boost your engagement and fanbase numbers. However like all social media content, you’ll generally only see spikes in fan acquisition from that content within the first 24 – 48 hours of posting it. After that, it is done. This is the core of being a DJ or producer, right? As a lot of commenters have aptly pointed out on this series so far, none of this social media crap (only somewhat paraphrasing) means anything unless you’re producing great music or mixes. Uploading tracks and sets are critical to show the world at large that you are good at what you do. Additionally, almost every promoter or club owner who considers booking a DJ will expect to listen to your recent work and know that you’ve got the chops necessary to play their gig. Mixes: Upload one incredible DJ mix per month. You are only ever as good as your last mix. Approach that mix, over the course of the month, as if you were preparing for BBC Radio 1’s Essential Mix. It will help you to hone your craft, and the preparation for that mix will really help you to understand your records. It will make you a better DJ. Consider doing the occasional crazy sideways mix, in a genre or sound that you love but are not known for. One of the biggest fears that all successful DJs have is being “pigeonholed” to one particular genre, so demonstrating on a semi-regular basis that you are capable of laying down blistering drum & bass, Ibiza chill out, or funk & soul, will help soften any walls that fans have naturally built around you. New Tracks: Perhaps the pinnacle of DJ social media content. If you have a new track, or a collection of new tracks ready to go, understand that in your hands you have a whole load of potential new fans, so try to release at least one new track or remix a month to keep that fanbase growth on an upward curve. Unreleased Tracks: As a DJ who likely goes digital digging on Soundcloud fairly regularly, you’ve probably seen a number of these tracks, often marked as “Preview” or “Coming Soon”. If you’ve got an upcoming release, this is a great way to tease a track. Then when the track comes out, don’t forget to update it with links to the complete song and a download/purchase link! WHERE DO I POST WHAT MUSIC? One thing to consider is what channel you want to upload your music content to. There are many music hosting sites that offer excellent hosting and streaming services for free. So which channel should DJs use? The short answer is, all of them, because the further that your music spreads, the more potential fans you will reach. Never restrict yourself to just one channel, because at the end of the day, you shouldn’t really care where your fans are, you should only care that they are fans. How they choose to consume your music content does not really matter. Of course, uploading music to multiple channels takes a lot of time, a luxury that most bedroom and part-time DJs do not have. JustGo Music’s uploader is one tool that could help you (there are others available too). The PowerUploader quite simply allows you to upload MP3s to the big three channels – Soundcloud, Mixcloud, and YouTube – in one upload. It will even convert your MP3 and artwork into a YouTube video, saving you precious time. PRO TIP: There’s a good chance that people who are following you on one platform are following you on another, meaning that if they see an identical post in more than one place, you could come off as annoying. Customize your updates to show your followers some love – don’t just post duplicates all the time! Gig + Industry Photos: The objective here is to share what you experience. Have a packed house? Make sure someone takes a picture of you performing for it! 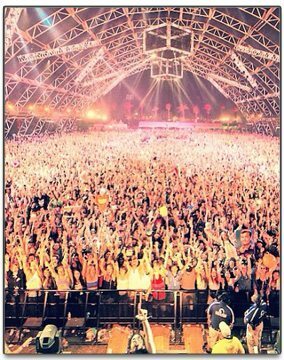 Bassnectar does this on every stop on his tour and makes sure to jump in to the very bottom of the frame (example from this year’s Coachella at right). The same principle applies to taking pictures with other DJs and industry figures, simply because it shows that you’re well-connected. This truly works on a local level just as well as it does on a world-tour artist level. Start A Meme: This type of media post is a bit harder to guarantee success on if you’re not a world-famous DJ, but it’s an absolutely brilliant social media tactic. Starting a meme that encourages your followers to post their own media of a particular circumstance that follows a certain hashtag. Look no further than Diplo’s #expressyourself or A-Trak’s #disconap for examples. Commentary / Discussion Photos: This is more for the engagement that you’ll get out of it – start up a discussion with a photo. The key here is to ask a question that people can quickly answer, or will want to discuss. A great example is Ean’s recent Facebook post sharing a photo of the Midi Fighter Uno and asking “What would you map it to?” – gathering over a hundred different responses. Finally, a great way to get visibility beyond your normal circles is to run a competition or contest on your social media networks. Again, the goal here is to get all of your followers engaged – so make the contest simple to understand and enter. You’ll want a tool that manages the contest for you – JustGo Music has a good one that collects email addresses, and DJTT uses a tool called Rafflecopter for giveaways to gather more likes (this is more ideal for embedding into a website, less good for artist social media). Terry Church is an electronic music journalist, filmmaker, editor, and PR with over a decade’s experience in editorial content, video production, artist and DJ reputation management, community creation, and music publicity. This article is written collaboratively with DJTT’s Managing Editor, Dan White. Editorial Disclaimer: Mr. Church is the force behind JustGoMusic – which is why it’s mentioned multiple times in this series. There are other great tools out there for social media management – like HootSuite and Buffer – but JGM is focused on and being designed for DJs, labels, and producers.